Making your own spice blends is not only satisfying, but you can produce the quantities you need and avoid wastage of sometimes expensive commercial blends. This earthy and tangy za’atar, a Middle Eastern spice blend, is one you’ll want to have on hand. It’s about time we had another spice blend around here, don’t you think? Za’atar is a Middle Eastern spice combination that I’ve been wanting to make for almost a year. The word is Arabic and can also be used to describe the herb thyme; if you’re buying za’atar instead of making your own, make sure you get the spice blend. I’ve learned that za’atar, like many other spice blends, has many variations, some regional and some also due to personal preference. 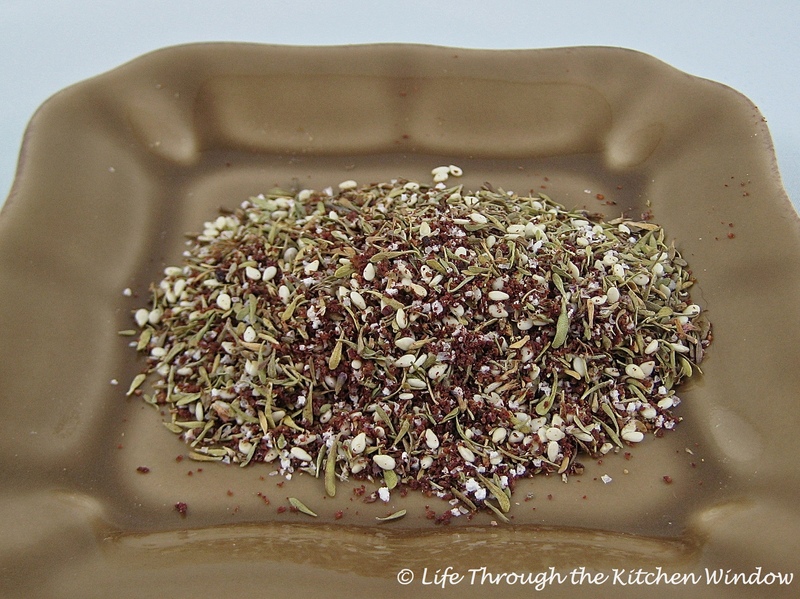 Sumac is an important part of this spice blend. It’s an intensely deep, dark reddish colour and its fragrance and taste is fruity but sour. Thyme is the traditional herb used in za’atar but in my research I found recipes that used other herbs as well. I used dried thyme, but if you use fresh it will only keep a few days. 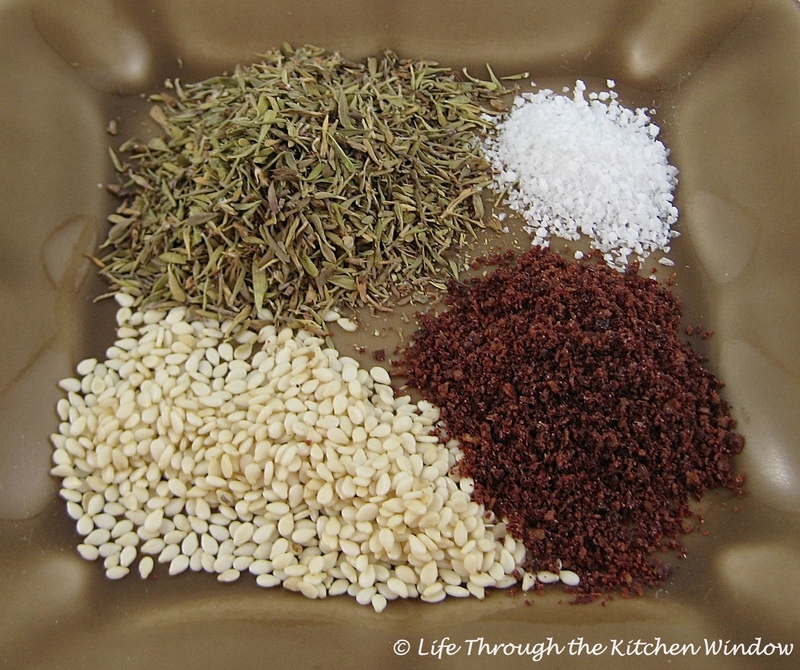 The blend also includes toasted sesame seeds and some salt. Different recipes use these four ingredients in different proportions. The recipe that I used is from Ian Hemphill’s The Spice and Herb Bible: A Cook’s Guide, an excellent reference that I keep with my cookbooks. He advises that za’atar complements breads and potatoes very well. I’m using it today on a chicken dish that’s in the oven right now (more about that dish another time). But let me tell you, it smells heavenly in here! Source: The Spice and Herb Bible: A Cook’s Guide by Ian Hemphill. Stir all the ingredients together until well blended. Wasn’t that easy? By the way, it’s a bit later now and we just ate our chicken dish; it was delicious. I will definitely be using more za’atar, and maybe next time I’ll make a bigger batch. I should be able to keep it well sealed in a cool, dry place for at least six months. In my research, I found a blog called Taste of Beirut with an informative post on za’atar, here. I’ll be returning to this site to learn more about Lebanese cooking. Trying new spices is a way of transporting myself to parts of the world I’ve only read about. The power of a few ingredients is amazing, and discovering blends like za’atar make an otherwise ordinary meal an adventure. I feel the heat of the blazing sun as we cross the overland trade routes…. The blazing sun sounds very appealing right now. It’s been a gray, damp day in Ontario and where is all the beautiful white snow? I have my eye on one of his books for my upcoming birthday gift to myself. The dish I made last night was an Ottolenghi recipe, adapted by Spree at Cooking-Spree. If that’s any example of his cooking, then I want more! Love these spicy blends …like the soup you made on the weekend….great photography Mar!!! 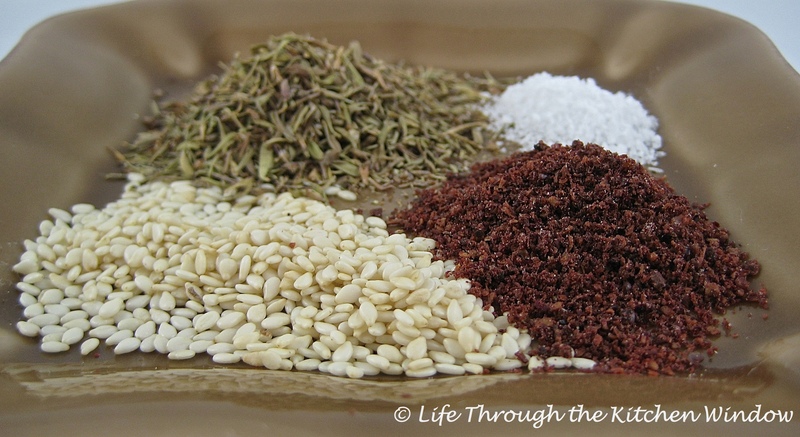 I have a board for my spice blends on Pinterest. I’m glad to hear you’re going to make your own za’atar. With only three ingredients, it’s easy to make and you can adjust the proportions to suit your taste. I made a bigger batch yesterday and put more sumac in it because I like its tang. Have fun! I found you on Pinterest and now I’m a follower. I was honored to see you’ve “pinned” me. Thanks, Mar! Mmm! Love Za’atar and your photos are gorgeous! Thank you! I’m going to make another batch – a big one this time – and soon! I love it in just about anything. Have never tried making my own blend but you are inspiring. Have you ever tried using za’atar in rice? I love it! Well, it’s quite a compliment to hear that I’ve inspired you! Thank you. So far, I’ve only used za’atar once, in a chicken dish I’ll be writing about soon. But don’t worry, I think I’ll be using in lots of things too! Love the image of your friend’s father-in-law carrying around his treasure trove of spices! I do like making my own blends. I started years ago with Emeril’s ‘essence’ but have branched out now to blends from other cultures. 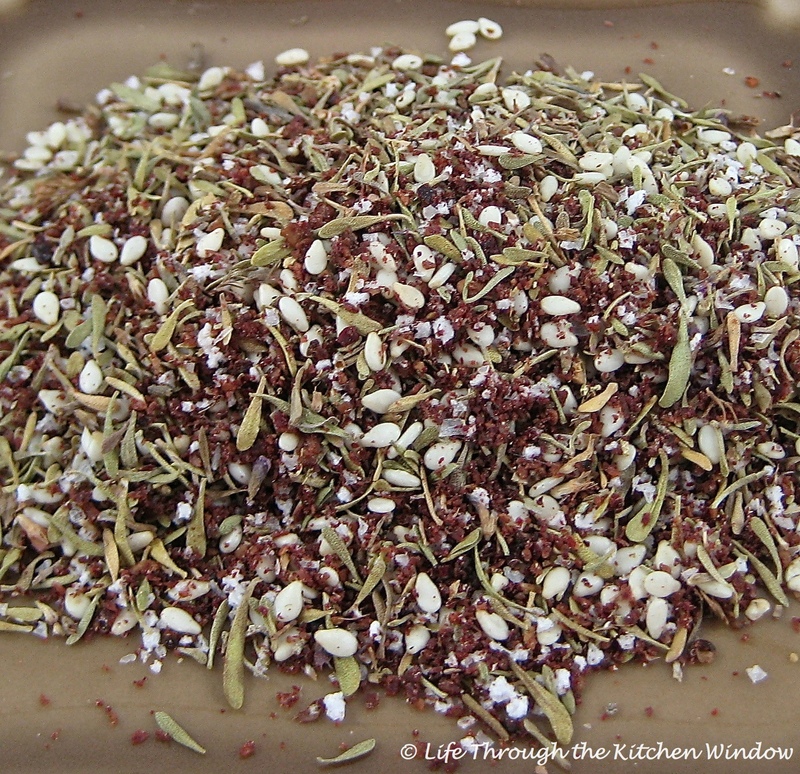 Last year I started making my own Indian spice blends, and I have a big container that I keep all the spices in. Unlike the gentleman you talked about, though, I don’t cart it around with me! I’m now learning more about MIddle Eastern cooking (not that I’ve mastered Indian in any way, shape or form, but why limit myself to learning only one cuisine?). I made za’atar again yesterday, tweaking it to add a little more sumac because I like the tartness and colour of it. I added some olive oil to make a bit of a paste that I spread on chicken thighs, which I then baked. Such an easy, tasty dinner!